The decision of which way to get to Crick was made last night. 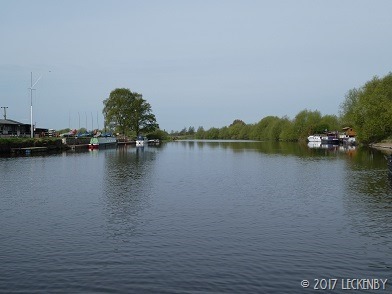 Over the last couple of years we have done the Trent and Mersey from Sawley a lot of times, whereas we’ve only done the River Soar heading north, never south, so the Soar and the Leicester section of the Grand Union it was. Initially we set off this morning with the aim of getting as far as we could towards Leicester so that on Thursday we could push through the city. We’ve stopped in the centre before but the route in and out are renowned for being troublesome. 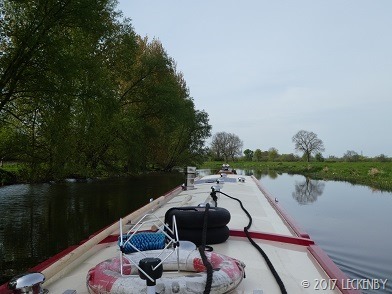 We winded leaving one boat on the pontoon and headed downstream to the junction with the Soar. Mick upped the revs so that we didn’t get the opportunity to know the weir. Immediately the feel of the river changed, a slower flow and narrower. 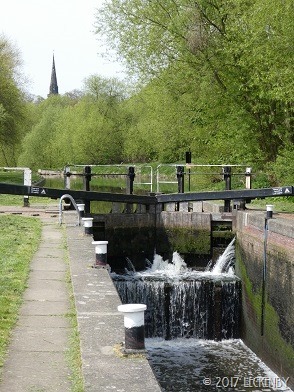 Through the first flood lock of the Soar we passed Redhill Marina. 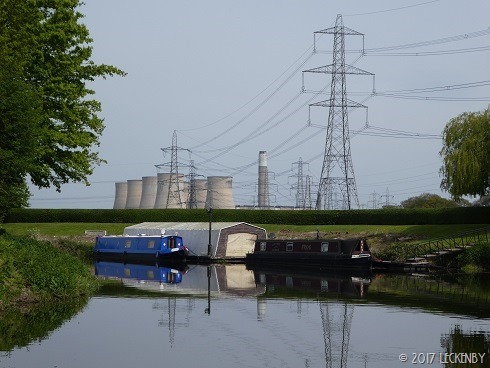 We were wanting a bag of coal, but the chandlery didn’t look that inviting so we carried on looping round Ratcliffe-on-Soar Power Station passing many moored boats. I wondered what Ken would have thought if I’d asked for Oleanna to be painted in leopard print. 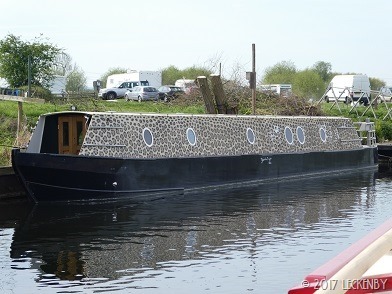 A short distance further was Kegworth Marina which had bags of coal on display. 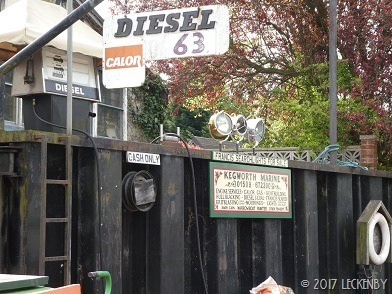 We pulled over and after checking that their advertised price for diesel was correct we filled the tank. This is the cheapest we’ve seen this year if not longer, luckily we had enough cash on board to pay. Through another flood lock and then we arrived at Kegworth Deep Lock. 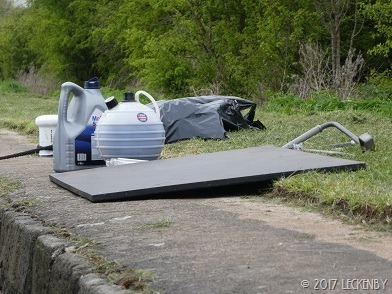 This is deep (strangely enough) and has been the scene for quite a few boats getting caught on the cil over the years. 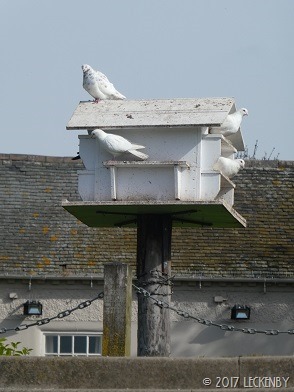 A sign warns of three sinkings in the last twelve months and suggests using the blue risers. With this in mind I decided to have a go at working the lock and Mick could cling to the rope on Oleanna. I was as careful as I could not to push with my right foot when opening and closing the gates and stayed on the one side of the lock to work it, crossing lock gates can involve big steps on and off them. Mick brought her in and passed a rope around a riser only to find that it wasn’t attached at the bottom, so it would be of no help what-so-ever! We passed our long rope around a bollard instead. It took forever for the ground paddle to raise Oleanna up to anywhere near the cil, we got bored and I gently opened a gate paddle. 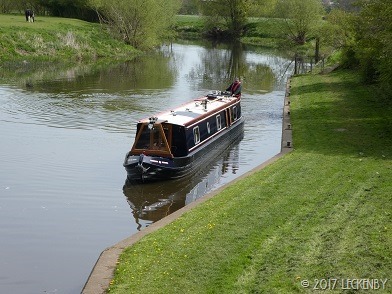 No sign of the friendly fox who reportedly lives near here but there was a Lillian imposter moored above the lock! Today was looking like it would be a long day to reach our goal and Oleanna’s engine had by now reached 49.6 hours, her first service was due at 50. 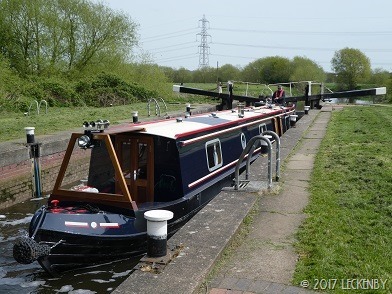 So our plans changed, once up Zouch Lock we pulled over had a leisurely lunch before Mick donned his overalls and bent himself double to get intimate with her engine. 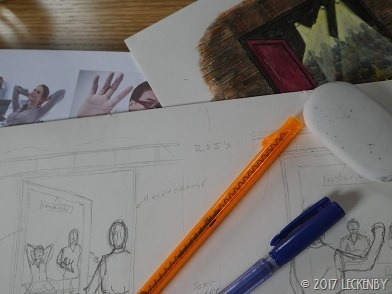 I spent the afternoon starting to work on a cover illustration I’ve been asked to do. After a couple of failed attempts I had to resort to finding images of body language on the internet for a bit of reference. When I searched for awkward body language I was quite surprised at the number of images that came up of the Trump Merkel meeting at the White House, my word that was awkward! 3 locks, 2 flood locks, 6.08 miles, 1 wind, 1 right, 50 litres, £10 coal, 15 years in the water, 0 survey! 1 broken riser, 1 change of plan, 2 rough sketches, 50 hour service, 1 oil filter, 9 litres oil, 1 wet bum cheek, 1 sore foot, 1 empty yellow tank, 1 toy prison! This entry was posted in Uncategorized on 19th Apr 2017 by pipandmick.